When I was pregnant with our baby boy, I was under the impression that I would have a dirty body and home. I constantly heard experienced moms talking about how they hadn’t showered for days and all of the plates were hiding somewhere in the sink. I’m sure I was focusing on these details more than I should have, but it made me make a small promise to myself – that I would get a shower every day that I wanted one. This post contains affiliate links. I have tried to link to the actual product we own whenever possible. Otherwise, I have linked to a similar product. These links are intended to help you find products that will help your family. I only recommend products that I love. I do make a small commission from any purchases made through these links. As you read through this list, I want you to keep a few things in mind. There is no “magic product” that will make all babies happy. It’s been my experience that different babies like different things. For example, my oldest nephew hated the swing and as a result, my mom passed it on to us when Baby Fox was born. It was the only way we got him to nap from around two months until he was six months old. He loved his swing. The other thing I want you to keep in mind is that sometimes it takes a few tries for a baby to fall in love with something. So, if your little one seems to hate something, don’t just throw it in the closet and forget about it. Try again a few more times at different ages. Their likes and dislikes are constantly changing. Now, let’s get on to that list! Our Pack and Play has been a favorite since the day we brought Baby Fox home. We used the bassinet insert so that he could sleep next to our bed in the beginning. Our model also came with a vibrating cuddle cove that we used when he was a newborn. I would often put him in the rocker and set it right out the shower. He would often take a nap while I got in a quick shower. Now, we use it as a play yard and it still allows me to take a quick shower when it’s needed during the day. A few special toys or books and he can stay entertained for a solid twenty minutes most days. This particular product comes in many shapes and sizes. It also goes by several different names including activity jumper, play gym, and exersaucer. Essentially, these are a seat with toys surrounding them for a baby to enjoy. In most cases, they allow the baby to bounce or jump up and down. We had this activity jumper and Baby Fox loved it. We could put him in it while we cooked or did dishes and he would stay entertained for quite a while. This was actually an item that I didn’t think he would like because my nephew wasn’t a fan. There are a variety of chairs and bouncers available for babies to sit in. Some people swear by the Bumbo seat, but our little guy hated the version we had. We did find this convertible rocker though and quickly fell in love with it. It has multiple settings and is designed to grow with them from infancy to toddlerhood. This is another item that I have used outside of the shower when he outgrew his cuddle cove. There are several different versions of nappers out there. Some play yards come with napper attachment like the one I mentioned above. There is also the rock and play, which is popular with a lot of parents. 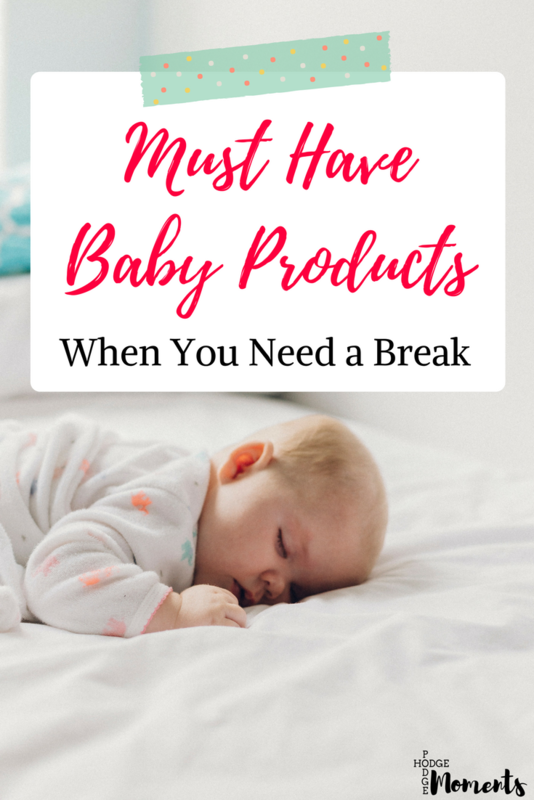 Nappers are helpful because they tend to be portable and give you a safe place to put the baby while you take a quick shower or clear the sink of dishes. I mentioned in the beginning that our son loved his swing. It was a lifesaver when it came to naps during the day. (Due to safe sleep recommendations, we only used it for naps because he was supervised.) The swing we had from him had a mobile, lullabies, and could be set in different positions. The cradle position was great for naps when he was young. I have also been known to use this one outside of the bathroom door during a shower as well. The Mamaroo is another popular baby swing that many parents love to use with their little ones. Most of our house is carpeted. In fact, we put in new carpet throughout the house shortly after we moved in. This made me wonder if a walker would be practical for us or not. I happened to find one on a yard sale site for cheap and decided to give it a go. We kept the walker in the kitchen (our only hard floor) and it was very helpful when cooking dinner or cleaning up from a meal. Baby Fox loved zooming around the kitchen and chasing the dogs with the walker – even after he started walking himself. He had been walking for three months when we finally put the walker away. There you have it! 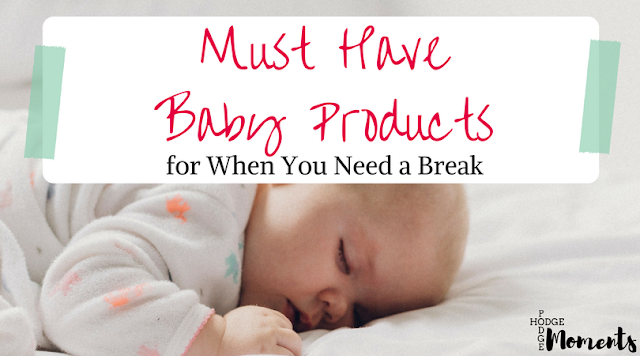 My top baby products that allow you to take a bit of a break and get things done during the day. Don’t worry – Baby Fox got plenty of attention from us. These products simply allowed us to keep our sanity so that we could give him our undivided attention. Do you have any must have products that helped you out? I’d love to hear about them in the comments below – especially since we plan to have more babies in the future! 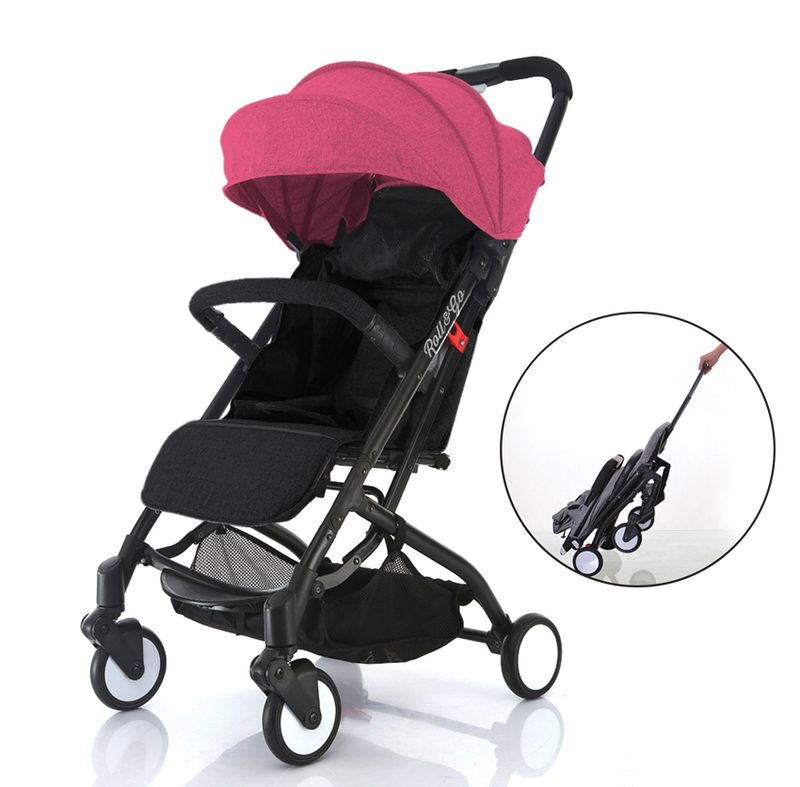 And, speaking of products that help you take a break, a ride in the stroller can be a great solution when mom and baby needs fresh air. 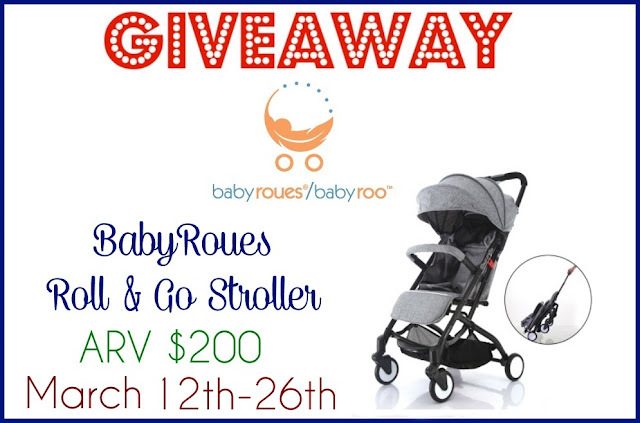 And today, we’ve got a giveaway going for a great stroller! Read the details below and then follow the directions in order to enter the giveaway! Whether on a family trip or making a quick run to the market, keeping in mind a child’s comfort as well as the parent’s needs is always top of mind for Babyroues. Ordinary strollers are either too bulky and heavy or too flimsy and problematic and simply don’t cut it anymore, which is why Babyroues has set out to create a lightweight full-size stroller that will accommodate both parent and child. This Roll & Go urban stroller is perfect for the family on-the-go with compact detailing and a patent pending telescopic pull handle that allows for easy transport through airports, parks and city streets. Inspired by the juggling act of carrying strollers up and down escalators, the Roll & Go is the first to feature a telescopic pull handle that transforms the stroller into a luggage like carry-on. 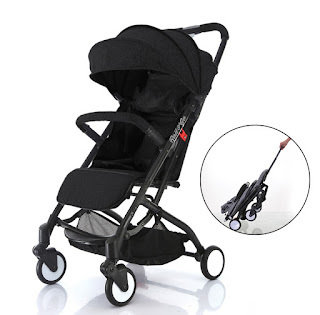 This allows the stroller to be easily pulled across any street or store without having to deal with any slamming of ankles and strollers. In addition to its fold hold, the stroller is so compact that it easily fits in overhead compartments on airplanes and any form of transportation. With over 30 years of experience in the manufacture of baby strollers, Babyroues is a company always dedicated to excellence. Keeping both parent and child’s comfort and needs in mind, they look to innovate with the highest technological advances while at the same time giving their customers great value. more right here regularly. I am slightly sure I will be informed many new stuff proper right here! Love all the useable information here! Thanks for sharing this with us! Thanks for stopping by! Glad to hear it helped! Very helpful. I like these items because they also teach baby independence while you keep your hands free. Pinned! Independence was a big goal! I wanted to make sure I started young and now at 14 months, I’m so glad that I did. It’s really a great and useful piece of information. I’m glad that you simply shared this useful info with us. Please keep us up to date like this. Thanks for sharing. I simply want to tell you that I am just all new to blogging and site-building and honestly enjoyed you’re web-site. Almost certainly I’m planning to bookmark your site . You really come with amazing articles and reviews. Bless you for sharing with us your blog site. I simply want to mention I’m new to blogging and site-building and definitely savored this blog site. Very likely I’m want to bookmark your blog . You really have perfect posts. Thanks for sharing with us your website.